While driving being a passenger on the drive to London I finally finished reading through the August issue of The Public Historian. A couple of the articles in this issue sparked some reflection on my historical practice, including Charles W. Romney‘s “New City Guides and Anachronic Public History” article. Romney examined historical cities guides including the Cleveland Historical app, the Infinite City atlas, the book Map of Perceptions, and the Wildsam field guides. This examination looked at the ways in which each city guide uses multiple chronologies to tell the history of a place. Romney makes a number of interesting points about contested chronologies that are applicable to many public history projects. His analysis is applicable to many historical narratives outside of city guides. Most public history initiatives adhere to a single timeline or chronological framework. This can commonly be seen in written narratives, museum exhibits, living museums, and preservation projects. A single chronology often works well to deliver simplified narratives and can serve as an organizing idea. multiple chronologies can enhance public that stress relationships between different developments and that connect events from different time periods. Multiple chronologies also improve public projects showing uneven spatial and temporal shifts. Fragmenting time and presenting multiple narratives that are intertwined can allow for a diversity of experience and voices to presented in a project. When reading this article I was struck by how this approach would be particularly useful when discussing contested spaces and to bring forward the voices of marginalized groups. The obvious example in my work is residential school buildings that are now used by mainstream organizations. These spaces have multiple narratives to tell and many are still evolving as living history spaces. In some cases collective memory is contested. Presenting a timeline of a contested space might involve imposing an unaccepted chronology on a project. There may be better ways to display history for this type of project than using a chronological order. Multiple chronologies, unstable and changing chronologies, and contested timelines all have a place in public history. It’s up to public history professionals to think critically about the best ways to interpret and present historical narratives. I recently wrote a short post on historical trauma and self-care. Shortly after writing that post I read Shurlee Swain‘s Public Historian article “Stakeholders as Subjects: The Role of Historians in the Development of Australia’s Find & Connect Web Resource.” Swain’s article reflected on the challenges of creating the Find & Connect digital resource that was created as a result of the 2009 government apology to Forgotten Australians and Former Child Migrants. The Find & Connect site brings together historical resources and documentation relating to institutional care in Australia. It contains histories of each institution written by public historians that have used a collaborative approach to history; combing information found in official records with oral history accounts of institutional care. Swain’s article highlights the challenges of collaborative history and of historians working as mediators to present the past. I found a number of similarities in Swain’s discussion of the Find & Connect project to on going work relating to residential schools that attempts to provide a fuller picture of the past, which incorporated administrative/government records with survivor voices. Swain’s also outlined the implications for historians working with this type of project. She argued that “There is a need…as a historian, to ‘get it right’. ‘Getting it right’ is not about finding the truth because the truth is a different story for everyone…It is about finding the “right voice to present history from multiple viewpoints.” Finding balance when writing about historian trauma is extremely difficult. Researchers tend to work in isolation and creating a support network can be instrumental in creating strong coping mechanisms. Swain’s article was the first time I’ve seen a public history project openly address the needs for emotional supports. Her work also made me wonder about the lack of resources available for most historians researching residential schools and what can be done to emotionally support people who are engaging in important work independently. The recent issue of The Public Historian featured an article, “Seeing Yourself in History: Community Archives and the Fight Against Symbolic Annihilation”, by Michelle Caswell. The article looks at the development of the South Asian American Digital Archive (SAADA) and the role the archive has played in preserving the marginalized history of the South Asian American community. Caswell argues that “community-based archives serve as an alternative venue for communities to make collective decisions about what is of enduring value to them and to control the means through which stories about their past are constructed.” Community archives have the potential to empower communities, reunite communities with their past, and create a shared history. Like many grassroots archives the SAADA was created in a response to the omission of the ‘official’ historical record. The South Asian community did not see themselves in popular history or in more formal repositories — sparking the creation of their own community archive. Caswell’s article on the SAADA is an example of a community archive that has much success. The first six years of operation saw 1800 digitized records being created and the collection being used by educators, community members, and researchers. The digital only model of the archive is interesting. The SAADA has on public space and it’s collections are purely digital. The original items remain with larger repositories or the community members who own them. The access created by the emphasis on digitization is great. But I wonder about the long term preservation of the community based materials and helping community members preserve those original documents. The recent special issue of The Public Historian focused on public history and environmental sustainability. This issue builds on the sustainable public history theme that was the focus of the 2014 National Council on Public History conference and the digital collection Public History in a Changing Climate which appeared on the Public History Commons. The special journal issue contains a number of interesting articles on the desire to engage the public with environmental history and a changing environmental landscape. The article “A View from Scotland’s Coast” by Tom Dawson which looks at coastal erosion and the impact of erosion of heritage sites provides a glimpse into the potential of engaging the public in issues of heritage, climate change, and natural heritage. Dawson’s writing focuses on the work of the Scottish Coastal Archaeology and the Problem of Erosion Trust (SCAPE Trust) and highlights examples of coastal erosion’s impact of heritage sites in Scotland. For example, in Bora, a small coastal town in Northern Scotland, industrial buildings from the sixteenth century were uncovered on the coast. Beginning in 2004 SCAPE worked with the local community and organizations to excavate buildings and begin to document the site. However in 2012 a winter storm destroyed the sixteenth-century salt pans that had been uncovered. All that remained were piles of ruble on a beach below. This and other examples of heritage sites endangered by coastal erosion reminded me a lot of my trip to Ireland. While touring the Dingle Peninsula there were a number of site that had been partially destroyed be erosion or were at risk because of the changing shoreline. I remember thinking at the time about what could be done to save such sites, particularly in a country that is filled with similar heritage structures. Dawson argues that “being able to demonstrate the value of an asset is key to getting the item preserved, or at least recorded before it is destroyed.” Heritage sites need to advocate for the value of their existence and preservation, especially if an economic advantage to preserving the site isn’t immediately apparent. SCAPE believes that involving communities and local populations in archaeological and preservation projects is key, “working directly with heritage gives people a greater understanding of its importance, and this appreciation spreads through the community and beyond” Additionally local residents often hold valuable knowledge which has been passed down through generations about local heritage sites, landscape changes, and past events. SCAPE’s development of the Scotland’s Coastal Heritage at Risk Project (SCHARP) highlights a collaborative effort to engage communities in preservation. The project relies on the public to update and correct information collected via coastal surveys and report any changes to the sites. The SCHARP project website includes data for 12,000 coastal sites and invites the public to update information based on local knowledge. The site is relatively user friendly and interesting to explore even for those without a local connection to Scotland. SCAPE also asks community members to nominate sites for preservation. Though the ShoreDig project SCAPE works with communities to facilitate community excavation and to encourage engagement with threatened local heritage. Dawson’s work highlights the crucial role the public has to play in the preservation of coastal heritage. Community engagement is essential to assessment of local heritage sites and working with the public can help preserve information and sites which would otherwise be lost in changing landscapes. The Spring 2014 issue of The Public Historian focused on contested histories, addressing controversy through public history, and the relationship of controversy and commemoration. Christine Reiser Robbins and Mark W. Robbins’ piece “Engaging the contested Memory of the Public Square, Community Collaboration, Archaeology, and Oral History at Corpus Christi’s Artesian Park” is an excellent example of the challenges and potential benefits of tackling contested histories, issues of identity, and public input. The article uses the case study of Corpus Christi’s Artesian Park to highlight the potential of using community engaged methods and collaborative designs that integrate oral history, archaeology, and archival research to build historical narratives. The history of the Artesian Park and its commemoration has been filled with controversy. In 1975 and 2002 attempts to commemorate the the park were filled with community disputes, disagreements of interpretation, and debated history. In 2012 a public archeology and oral history project was launched in the community to focus on expanding historical narratives relating to the Park. The project highlighted the possibility of creating a new narrative that combines personal histories, civic history/myth, and national narratives. And the results showed the diversity in experiences and histories relating to the park. This case study is a great example of the importance of community participation, collaboration, and the integration of multiple narratives into historical interpretation. The long held nostalgic civic histories of the Park represent only a portion of the complete heritage of the Artesian Park. Community collaboration and community input is crucial when addressing heritage the is contested and deeply community rooted. Public history projects have the potential to bring together communities and start conversations relating to heritage and broader community issues. The winter issue of The Public Historian included an interview with Azie Mira Dungey the creator of the “Ask A Salve” web series. Dungey was a living history first person interpreter at George Washington’s Mount Veron, where she portrayed Caroline Branham an enslaved housemaid. The web series draws on her experience working at Mount Vernon and some of the questions visitors asked when she was in character as Caroline Branham. “Ask A Slave” and the corresponding interview with Dungey highlights some of the things public historians need to consider when designing historic site programming. Living history sites are in a unique position to facilitate difficult conversations around race relations and the history of slavery. “Ask A Slave” approaches these difficult conversations as satire while commenting on important issues in a humorous way. Here’s the first episode of the web series. The rest the first season of the series can be found here. The winter issue of The Public Historian contained an article by Katrine Barber titled “Shared Authority in the Context of Tribal Sovereignty: Building Capacity for Partnerships with Indigenous Nations.” Barber’s article addresses the challenges of Indigenous and non-Indigenous public history projects, historical colonial practices, and the idea of shared authority and decolonial public history practices. Using this definition of decolonial public history as a starting point Barber goes on to discuss the challenges of redeveloping historical narratives, the need to acknowledge the current atmosphere of colonialism, and hurdles in developing Indigenous/non-Indigenous partnerships. This example brought home the potential impact of shared authority on historical writing and the benefits of approaching public history from a decolonial perspective. The article left me examining my own public history practice, particularly given the work I do with Residential School Survivors and reconciliation. What preconceived notions and practices am I bringing with me when I approach a community project? And how can public historians generally learn more about fostering decolonial spaces. Barber’s work is well worth a read for those interested in Indigenous history, community collaboration, and decolonial spaces. A recent issue of The Public Historian contained an interesting article, “#VirtualTourist: Embracing Our Audience through Public History Web Experience” by Anne Lindsay. The article highlighted the ongoing challenges that cultural heritage sites in engage new and diverse audiences. Lindsay focused on the potential of institutional web presence in the development of audience and donor relationships. On a basic level the article highlights the fact that digital content has become an essential and expected part of any guest interface. Lindsay also argues that websites have the potential to create spaces of engagement and promote different types of educational interaction. However, Lindsay does indicate the online tools should be used as “a gateway to a more encompassing educational environment” . Essentially the narratives of online content and physical content should be interconnected. Historical narratives of particular groups (eg. women, slaves, farmers etc) should not be relegated to purely online content. Rather, traditional interpretation should be expanded on online and there should be clear linkages between digital and physical experiences. The two platforms can have different content but the essential mission of the heritage site should be reflected in both the online and physical presence. Lindsay’s focus on virtual narrative and the potential of virtual spaces for education and outreach is reflexive of a general feeling in the cultural heritage field. Many smaller organizations are struggling to develop digital content and platforms that appeal to changing audience needs. The technical knowledge and staff time commitment to create a changing web presence (something more than a digital version of a brochure) can be daunting. The cost vs benefit of any new initiative is always in the forefront of heritage institutions who are facing an uncertain fiscal future, especially when it includes venturing into uncharted territory. However, increasingly cultural heritage organizations are realizing the importance of digital content and digital engagement. Countless number of articles, professionals, and organizations are talking up the potential of digital engagement. There is a whole realm of potential donors and potential “virtual tourists” for organizations to engage on a purely digital platform. Additionally, digital content has the potential to enrich visitor experience, provide additional educational material, and create learning opportunities that sometimes aren’t feasible onsite. For example, a seasonal site that closes during the winter can still interact with potential visitors and donors online during the off-season, opening up expanded programming and outreach possibilities. The path to digital engagement doesn’t happen over night. But low cost options and documentation surrounding planning are becoming increasingly accessible to organizations of all shapes and sizes. Anne Lindsay, “#VirtualTourist: Embracing Our Audience through Public History Web Experience” The Public Historian 35, no.1 (Winter, 2013) , 77. The latest issue (Vol. 34, No. 3) of The Public Historian finally arrived at my house this week. The issue presented a number of interesting field reports and case studies, many of which focused on areas of nontraditional historical practice. One article which drew me in, was “Theatre: A Neglected Site of Public History” by David Dean. Admittedly, the draw was partially the Canadian content, but I was also intrigued by how public history and theatre co-exist. Dean’s article focuses on the use of theatre as a point of historical interpretation. Dean’s particular case study examines Vern Theissen‘s play Vimy. Theissen’s play uses the context of the battle of Vimy Ridge addresses subjects that many Canadian historians have struggled with — the nature of memory, attitudes toward war, Canadian nationalism vs. regionalism, and myth making. A visit to the Canadian War Museum includes exhibits which explore many of these issues with in a more traditional public history setting. Prior to reading Dean’s work I hadn’t actively given much thought to theatre as an interpretive style for traditional history. I like theatre and I like history and I also love historical film, so I’m not sure why I hadn’t previously made the connection before. Perhaps, my ignorance is in part due to what Dean points out as a lack of traditional acceptance of theatre as historical interpretation and a general lack of professional writing on the subject. That being said, Dean does an excellent job of making a case for historically informed theatre as a valid method of historical interpretation. Theatrical productions can be dynamic, emotional, and historically accurate means of engaging a larger audience. Perhaps the stage production of The Sound of Music (no matter how great might be) isn’t the best introduction into Nazi Germany. But, more historically researched and accurate productions such as Vimy can provide an excellent introduction to a range of historical topics. Comparing theatre to film, living history animators, and re-enactments highlight the logic behind the acceptance of theatre in historical interpretation. After all, re-enactors and living history site staff are all acting and tend to be using a script to guide their actions. This scripted interpretation is exactly what is occurring in a theatre setting. Just like any other form of historical interpretation theatre is susceptible to poor research and misinformation, but this is just as likely in a museum panel as it is in a well researched play. Dean’s article also inspired a consideration of the prevalence of history in theatre. History, historic events and settings are often used as backdrops for theatre. Settings, speech patterns, clothing and material culture are all aspects of history that can be portrayed (well or poorly) in theatrical productions. I’d be interested to know if anyone has seen a seemingly well historically researched production recently or other examples of Canadian history on the stage. The latest issue of The Public Historian, “Time’s Tables: Food in Public History” had a special focus on the interaction of food and public history. Reading the issue made me hungry and intrigued by the complexity of intertwining food into conceptions of the past. I particularly enjoyed Adam Steinberg’s article “What We Talk About When We Talk About Food: Using Food to Teach History at the Tenement Museum.” Steinberg focuses on how the Tenement Museum created a food walking tour and an accessible indoor version of the food walking tour. What struck me most is that the Tenement acknowledged that it wasn’t practical to let guests eat in the actual museum, but still saw the value in delivering content that relates to food. Food can be community defining, cultural specific, and a powerful emotive tool. Throughout Steinberg’s article and a number of the other contributors to this issue of TPH, the authors discussed the positive memories and connections that are often associated with food. Food memories often deeply personal and can include connections to childhood, family gatherings, holidays, and other significant events. Very few of the contributors mentioned the fact that food memories also have the potential to be negative or triggering. Certain food memories may be associated with less than positive experiences — economic depression and food shortages, wartime rations, residential schools, agricultural drought or hardship, or death of a loved one. Additionally, food trends can speak a lot to broader historical trends. Lack of food, socially acceptable food, and prices of food can all provide information about cultural and social conditions. These potentially negative situations are well worth discussion but like all sensitive topics should be broached with respect for the impacted audience. Overall, this issue of TPH reminded me of the need for food to be contextualized like any other topic. 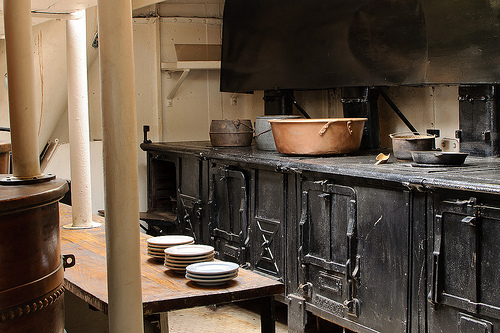 Having a living history site that includes a ‘summer kitchen’ where staff cook using items from their heirloom garden provides a good taste of the past, but it is also an education moment. Staff can contextualize food by including details about how food was grown historically, how produce has changed/adapted, gender roles associated with cooking, cooking methods, and economic impact on food. The ideal use of food in a public history setting is both tasty and educational.